If you want a digital recorder that keeps things simple, then Toshiba's keenly priced D-R160 could be for you. It's a standalone DVD recorder without a hard disk, and on paper it seems ideal for on-the-fly TV timeshifting and archiving from a PVR. But how is it in practice? The D-R160 is a very tasty looking machine. The sloping fascia and black/silver styling are nice touches, setting it apart from similarly priced rivals and supermarket cheapies. Build quality is also solid as a rock. 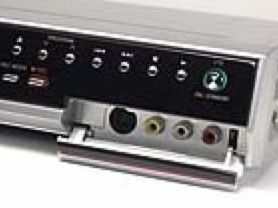 All the key playback and recording buttons are situated on the front, above a flap that houses S-video, composite video and stereo audio inputs. There's no DV-in, which could be a turn-off for digital camcorder users. The rear panel sports two Scarts, one of which is an output that delivers RGB signals to your TV. The other is an input that, sadly, only accepts composite signals and not best-quality RGB. Using this low-quality connection to record from an external source has serious implications for picture quality - and not in a good way. On the plus side, the D-R160 does sport progressive scan capable component video outputs, which is welcome news for movie fans with compatible progressive displays. The unit will only record on to DVD-RW and DVD-R discs. With several rivals offering multi-format recording, this puts the Toshiba at a big disadvantage. That said, the inclusion of DVD-RW means that you can edit recordings, provided the disc is formatted in Video Recording (VR) mode first. If you don't want to edit, or want to make sure it will play on a mate's DVD player, then format it in Video mode. There are six recording modes (XP, SP, LP, EP, SLP and SEP) offering between 1hr and 10hr on a disc. It lacks the manual bit-rate selection found on other Toshiba machines, but six presets are more than most recorders offer. The use of DVD-RW discs makes this a much more flexible recorder than RW-based rivals, with generous editing options. When formatted in VR mode, you can delete a section, divide and combine titles, add or delete chapter points, change the menu thumbnail image, change the name or delete the whole recording. But if you fancy something a little bit more advanced, you can use the playlist feature to arrange original recordings into a new sequence, adding or removing titles at will. Another benefit of using DVD-RW is the chasing playback feature, which lets you watch a programme from the start while it's still being recorded, or play a programme from a disc while another is recording. When it comes to DVD-R or DVD-RWs formatted in Video mode, the only editing options available are renaming or deleting recordings. However, labelling titles is easy, thanks to the mobile phone style text entry system. After you've finished making your disc, you need to finalise it for playback on other players. Unlike Toshiba's pricier recorders, you can't choose the menu style for the finalised disc: when you play the disc in another deck, you get a functional text menu with no thumbnails. Also bear in mind that finalisation of VR formatted DVD-RW discs takes a very long time. The onscreen menu system is delightfully intuitive, keeping with a straightforward list format. Helpful icons are liberally sprinkled around the menu screens to aid navigation, while sub-menus are sensibly structured. Text is written in plain English and is legible at all times. Plus, a round of applause to Toshiba for pulling off the rarest of feats by producing a clear, well-written and comprehensive manual. As for the remote, it's quite large and dull but easy to get to grips with. The layout is very thumb-friendly, and offers dedicated buttons for both changing the recording mode and accessing the timer list. So it's likely to fend off frustration for a long time to come. XP recordings from a Sky receiver onto DVD-RW disc are the best of the bunch, but the lack of RGB input really takes its toll on picture quality. Composite video recordings are littered with the tell-tale signs of this low-rent source - there's obvious flickering noise around the edges of objects (particularly noticeable with text and graphics), anaemic colours and an overall softness that hinders detail reproduction. The actual encoding is fine - there's no MPEG blocking noise to be seen or shimmering pixel noise around fast-moving objects, but that composite source just doesn't make the best use of the XP's high recording bitrate. In SP mode, football from Sky Sports is handled admirably, looking almost identical to XP mode. There's still no digital fuzz around the players, and colours are generally consistent. But with the aforementioned issues with the source, the result is still a let-down. LP pictures are still watchable, but as we move to EP, SLP, and SEP, the combination of composite feed and low encoding bitrates becomes more of an issue. In fact, give SEP a miss altogether. Our football footage looks too blurry, with very little detail and an unmissable halo of noise surrounding each player - it's like hooking up a mobile phone to your TV. To be fair the mode isn't designed for sport, but it's hard to imagine what it is intended for. But don't despair, the D-R160 performs much better as a DVD player. With RGB output now engaged, Revenge of the Sith looks stunning - the vast amount of computer-generated detail is admirably reproduced, colours are rich and there's barely any noise. 576p component video pictures are also superb, with a wonderfully wide contrast range that makes movies look very cinematic. The D-R160 lacks several key features, such as RGB and DV inputs, multiformat recording and a digital tuner. These omissions can sometimes be excused by a low price, but the fact that you'll find some of these features on similarly-priced rivals (such as the LG DR175 and Philips DVDR3305) doesn't endear us to the deck. More galling is that the lack of RGB input has such an adverse effect on picture quality. Toshiba should be living up to its own, normally high, standards. But it's not all bad news. Your £130 gets you a very good-looking recorder that offers solid picture quality with pre-recorded DVDs. Crucially, it's also very simple to use, and the support of DVD-RW discs puts some handy editing features at your disposal.